IMPORTANT NOTE: We will always dispatch on the NEXT dispatch day as default. Therefore please ensure you are in/open on the delivery day indicated above between the hours of 8am-Noon to accept your parcel. 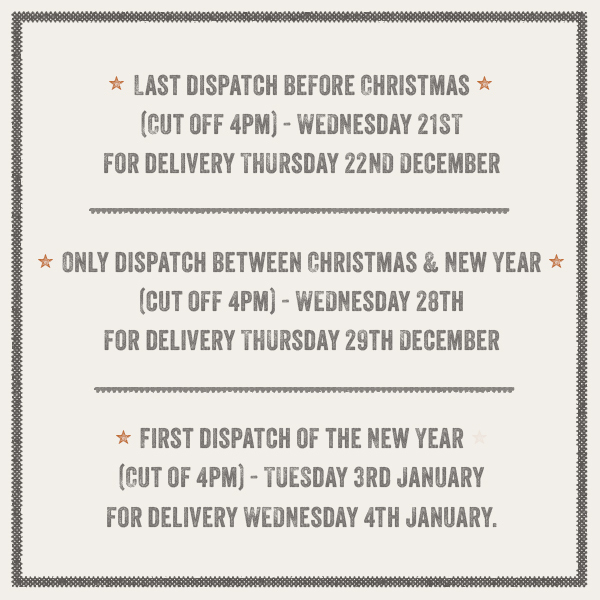 If you wish to delay the parcel until the first dispatch of the New Year please either use the future date facility or pop a note in the comments box during checkout. May we take this opportunity to thank you for you continued custom. We wish you a very fantastic break over Christmas and a prosperous New Year!